Both tracks are actually mixes of 'When I Was Young'. 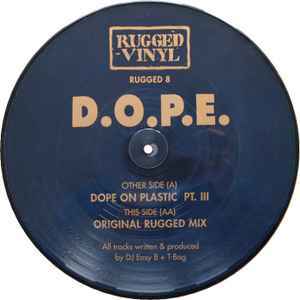 Dope On Plastic was the EP title of RUGGED 1 which featured 3 mixes of it, track AA of this release being one of them, then called 'When I Was Young (DJ Easy B & T-Bags Revisited Mix)'. Matrix / Runout (Other Side): RUGGED+8+A DOPE ON PLASTIC. O Stu. Matrix / Runout (This Side): RUGGED+8+AA DOPE ON PLASTIC!